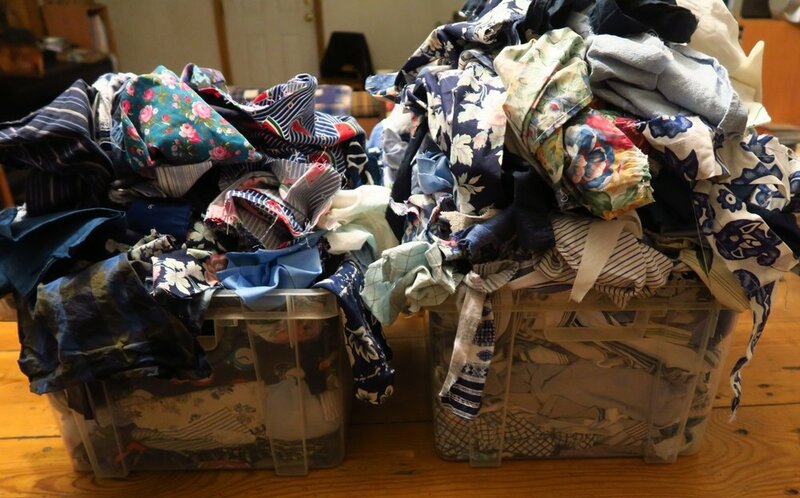 I think at least some of you know I've been attempting to whittle down my 6 boxes of upcycled blues fabric into 2 boxes - one for med/darks and one for lights. It's been a challenge. So far I've shown you two tops - and I've worked on several more. But that's not what this is about. As I've been working, I've been creating lots of blue scraps. When you work with shirts and pajamas, you tend to have a lot of small triangular pieces that get cut off because they aren't square. When you need a nice straight line, well, that piece ends up as a scrap. A small scrap. I may have been a little too generous while throwing the scraps into this bucket. But I was trying to keep them corralled. I may go back through the bucket and actually cut out 2 1/2" squares from these scraps as I am using that size for the next quilt top. I started throwing all my blue scraps into one bucket, determined to use those up in crumb blocks or sewing on paper tape, or making into string blocks, etc. You get the picture. 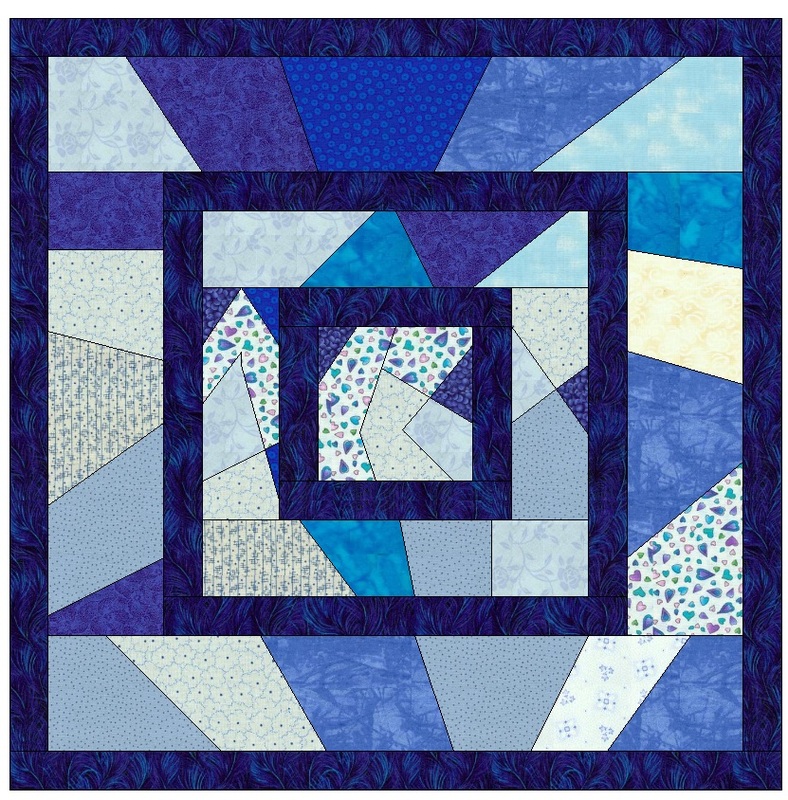 I had an idea for the first of these blue crumb block quilts. This is going to be a simple one. At least it's a simple idea. I've used up quite a few scraps sewn on to paper tape with just one block - and this plan needs 16 blocks. Because of things going on here, I didn't get that much done on crumbs this weekend. This is really all I did in fact. I made two of these blocks and decided on a plan. I suppose that's not too bad, actually. It does met the minimum requirements I set for myself of at least one good sewing session dedicated to crumbs or strings. This block takes about 150" of 1.5" navy/dark blue strips to get around those various places. It ends up about 20 1/2", so will finish at about 20" in the quilt. I am using a regular adding machine tape plus a wider adding machine or some sort of special machine tape that I found at an old 5 and 10 Store in downtown Newton, KS. I sew the scraps onto the tape and then sew the tape onto the block. I'll show all the steps next time. I have all the pictures I need to show you how I made this block. Sewing the scraps on to the tape. I started with a center crumb 4.5" square block. The center crumb block under construction. I actually have a piece of "made fabric" here and am just trying to decide where the most interesting cut should be. I'll use whatever is leftover towards the next crumb block middle. A little "off topic" maybe, but exactly where I am on this blues second hand fabrics project? Well, I've shown you 2 tops - I've finished 5 tops now and this will be number 6. I've started the 7th one just today (the 27th of November), but it is a pretty easy one, so maybe it won't take long. The only hold up now to showing you my tops is that I really want to get the patterns written up before I show them. So, that's what I'm going to focus on daily for at least an hour or two until I get them done. Here are the buckets of usable pieces of my blues. Since this picture I have taken out quite a few of the darker ones and put them on the table to cut into 2 1/2" strips tomorrow (the 28th of November). I need them. Then, the rest will fit into one of those tubs. I still have a tremendous amount of light blues, however. They are getting closer and closer to fitting into two of these tubs. Left is med/darks and right is my lighter ones. Generally speaking. There was a bit of mix up in this picture, but I'm still working on pulling out of these to cut up. Planning on a lot of cutting for the next two tops. Don't cringe, folks, I don't mind shoving them into these tubs. I iron as needed. I'm in way too much of a hurry to carefully fold them and/or roll them as I put them in the tubs. I have a whole lot of light blues, though. I'm trying to figure out how to use those up effectively. I also have plenty of blue pockets - I need to figure out something to do with them. I have a LOT. I'll count those for you and show you those at a different time. They will be a challenge but I really like using the pockets as pockets. I know that some people strip the pockets off the top of the shirt and use the fabric underneath, but I love the charm of the pockets, just like I like the labels. Plus, as someone who used to make garments, I appreciate the work that went into making a perfect pocket! And that's what's happening around here in Poland. My husband is still lying in bed a good bit of the day, but he is getting up using his crutches from time to time and going into his office to sit in his chair. He can't do it too much though, because it hurts and/or swells a bit even with it propped up on a footstool. So, then, back to the bed he goes. But I'm kind of sticking close in case he needs something. It's not always easy to carry things when you have to use crutches - especially the kind we have here in Poland! Have a great day wherever this finds you reading!